'Horde from Pacific to Atlantic' or Great Tartary was a true embroglio of colonizations, wars, religions covering most of Eurasia in XIII-XVIth centuries. The cathedrals, monuments, fortresses, relics, armours, swords, bibles, saints, warlords, artifacts, chronicles, maps and coins of Horde abound, but stay mostly misinterpreted. The Great Strife of Horde lasted nearly all of XVIIth century, the Great Tartary disintegrated into Moscuvite, Independent and Chinese Tartaries ending with Romanov dynasty usurping the throne of Russia. 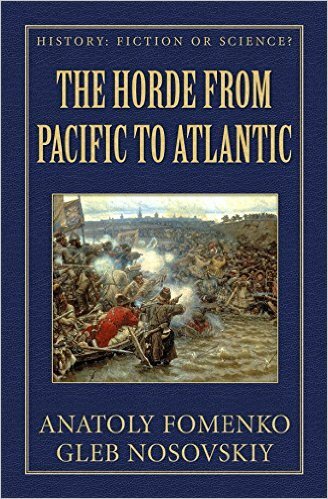 The very notion of 'Mongolian Horde' allegedly enslaving Russia for 300 years was merely a concoction cooked up by german historians brought to Russia by Peter the Great. They did quite a job of distorting all of pre-Romanov's history of XIV-XVII centuries! 'History: Fiction or Science?' series based on the New Chronology theory proves the inveracity of such consensual concepts as it contains abundant data, illustrations, charts and formulae with irrefutable evidence of mathematical, statistical and astronomical nature. Feel free to use them in your eventual discussions with the avid devotees of classical chronology. In fact, before reading this book, you have most probably been one of such devotees. After reading History: Fiction or Science? you will develop a more critical attitude to the dominating historical discourse or even become its antagonist.You will be confronted with natural disbelief when you share what you’ve learned with others. Now you are very well armed in face of inevitable scepticism. This book contains enough solid evidence to silence any historian by the sheer power of facts and argumentation. History: Fiction or Science? is the most explosive tractate on history ever written – however, every theory it contains, no matter how unorthodox, is backed by solid scientific data. The dominating historical discourse in its current state was essentially crafted in the XVI century from a rather contradictory jumble of sources such as innumerable copies of ancient Latin and Greek manuscripts whose originals had vanished in the Dark Ages and the allegedly irrefutable proof offered by late mediaeval astronomers, resting upon the power of ecclesial authorities.Nearly all of its components are blatantly untrue! For some of us, it shall possibly be quite disturbing to see the enoumous magnificent edifice of classical history to turn into an ominous simulacrum brooding over the snake pit of mediaeval politics. Twice so, in fact: the first seeing the legendary millenarian dust on the ancient marble turn into a mere layer of dirt – one that meticulous unprejudiced research can eventually remove.The second, and greater, attack of unease comes with the awareness of just how many areas of human knowledge still trust the elephants, turtles and whales of the consensual chronology to support them. Nothing can remedy that except for an individual chronological revolution happening in the minds of a large enough number of people.